The MTI-2100 features advanced fiber-optic non-contact sensor using reflectance electronic technologies for precise measurements of displacement, active vibration control, position, and distance for dynamic measurement in cryogenic, vacuum | high pressure, or in high magnetic field and harsh environment. It sets new performance standards with resolution up to 0.01 µin. (2.5 Angstroms) and frequency response from direct-coupled (dc) up to 500 kHz. The modular design of this fiber optic displacement sensor permits the use of a wide range of interchangeable and custom fiber-optic probes. These probes are immune to electromagnetic interference (EMI) and operate on almost any type of surface: metallic, composite, plastic, glass, or ceramic. Dual-channel capability permits simultaneous measurements of amplitude and phase. Selectable metric or English units. Reflective compensated units available to automatically adjust to target reflectivity changes. Digital display readout in engineering units eliminates the need to convert volts to displacement. Out-of-range indicator notifies the user if the target moves out of the linear range. Interchangeable probe modules allow the user to select from seven standard fiber-optic probe designs, providing 14 different standard measurement ranges and resolutions. High-resolution module resolves to 0.1 µin. standard or 0.01 µin. (2.5A°) optional. With external filtering, 0.004-µin. (0.1nm) resolution is possible. Standard 0-to-10 V dc analog real-time output is compatible with most signal conditioning equipment. RS-232 output for computer interfacing. 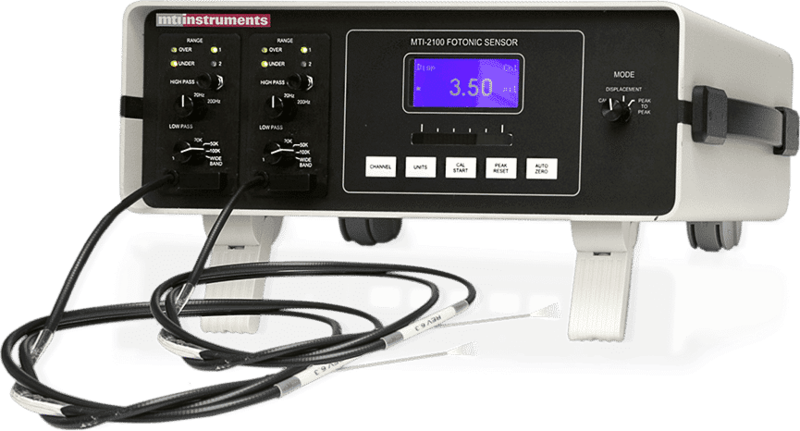 Contact MTI Instruments directly with any questions about our fiber-optic non-contact sensor measurement systems. 8000-4204 FS-3 Fotonic Probe Mount and Positioning Fixture – adjustable fixture to support and position probes over the target being measured. The system consists of a probe clamp, 2 positioning arms, magnetic base, c-clamp base and a micrometer with a 0.28″ (7mm) travel. The probe clamp holds probes up to 0.125 in. (3.2mm) in diameter with a reach of approximately 6″ (152mm).